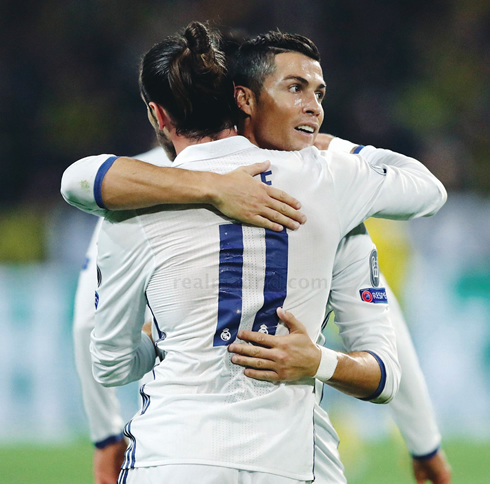 ﻿ Borussia Dortmund 2-2 Real Madrid. The yellow curse remains alive! 27.09.2016 » Borussia Dortmund 2-2 Real Madrid. The yellow curse remains alive! Real Madrid and Borussia Dortmund drew 2-2 this Tuesday night, in a very entertaining game that could have gone both ways. The Merengues were on the lead twice, but Dortmund's pressure proved to be more than they could handle. Real Madrid has never won in Dortmund and this tradition is probably going to last at least another year. The two teams settled for a 2-2 draw at the Signal Iduna Park, in a game where the Merengues grabbed the lead in two occasions. Cristiano Ronaldo with the opener made a statement of intent early in the first half, but then Aubameyang sent the game back to square one when he capitalized on a mistake by Navas. Later in the second half, Varane would put Real Madrid back in the driving seat, but the Merengues failed to hold on to the lead once again and conceded the final equalizer in the 87th minute scored by Chelsea's former midfielder, Andre Schurrle. It's a stat that haunts us all: Madrid have never won in Dortmund... And today that trend continued tonight after they conceded a late goal courtesy of another defensive error. 2-2 is the final result and while it may have been a result Madrid would have taken before the match, considering they were leading 2-1 with only a few minutes to go, it will be a massive disappointment. Real Madrid came into the game on the back of two consecutive draws, with the latest one, against Las Palmas, putting the team under heavy scrutiny. Ronaldo, having his actions when substituted scrutinized all over social media, was being watched very closely in the build up to the match. Zidane started the match with a reserved approach despite the fact that the players on the pitch were all heavily attack oriented. Real Madrid were content to sit back and let Borussia Dortmund approach them. Very similar to the way Carlo Ancelotti lined up against Bayern Munich in 2014. With Madrid sitting back, Dortmund did have chances to score, but some good keeping by Navas and some bad decision making in front of goal kept them at bay. Then it happened. As Ronaldo always manages to, he scored when criticism was at fever pitch. Capitalizing on a quick move that ended with Bale's backheel inside the box. 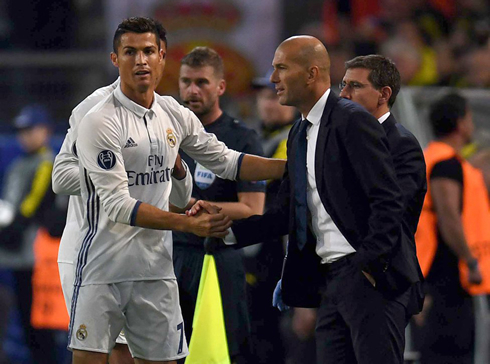 Ronaldo finished his second in this season's Champions League, right before running over to hug Pepe and Coentrao on the sideline. With that, Madrid did look more confident, but Dortmund still had their chances and right before the half they would equalize after a rare error from Navas. The usually reliable Costa Rican made a grave mistake punching the ball straight into Varane, just before Aubameyang was able to bundle it home on the line. A costly goal to give up that late in the half. Real Madrid would rise again in the second though. Raphael Varane, who had a great game at the back despite one or two errors, finished from point blank range after Karim Benzema's shot hit the woodwork. At 2-1 and with about 23 minutes left in the game, it all began to feel very similar to the matchup on the weekend against Las Palmas. And unfortunately, the outcome would be the same after a poor attempted clearance from Dani Carvajal left Andre Schurrle with an open shot in the box. The German international pummeled his shot home hitting the roof of the net for 2-2. In the end it's a bit disappointing, but Madrid looked better at times in attack than they have recently. Still, there is a lot of work to be done. Real Madrid will hope to break their drawing streak this weekend against Eibar. At least they don't wear yellow! Cristiano Ronaldo next game for Real Madrid is for La Liga on October 2 of 2016, against Eibar. You can watch Juventus live stream, Real Madrid vs Eibar, Borussia Monchengladbach vs Barcelona, Celtic vs Manchester City, Arsenal vs Basel, and Atletico Madrid vs Bayern Munich, all matches provided from our live stream game pages.